The What: Platinum Tools will feature its Net Chaser Ethernet Speed Certifier and Network Tester (p/n TNC950AR) during InfoComm 2018, held from June 6-8 at the Las Vegas Convention Center, booth C3445. Now shipping, the Net Chaser has an MSRP of $1,899.95. The What Else: To certify Ethernet speed performance of cable runs, the Net Chaser conducts Bit Error Rate (BER) tests by sending data packets down specified cable runs at defined data rates to check for errors at the maximum throughput of the link. The Net Chaser reports on signal quality that can degrade high-speed data transmission by measuring signal-to-noise ratio (SNR). Skew measurements report on the signal time delay between pairs that can impact Gigabit data transmission. Finally, the Net Chaser unit provides continuity testing that detects opens, shorts, miswires, split pairs, reversals, and high-resistance faults while accurately measuring distance to faults and total cable length. 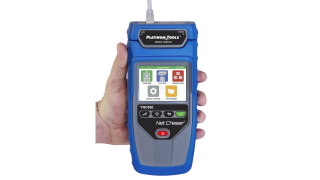 “Made in the USA, the Net Chaser Ethernet Speed Certifier and Network Tester offers a complete solution to test and speed certify the data-carrying capabilities of Ethernet network cables up to 1Gb/s by testing for noise in the network, detecting faults in the cable wiring, and ensuring that cables are able to support the speed capabilities of active equipment,” said Jason Chesla, Platinum Tools marketing manager. “The Net Chaser’s advanced discovery gives the clearest vision of network layout and interfaces between active components such as servers, switches, routers, etc. All the information is collected, stored, and ready for reporting Ethernet speed certification (Speed Certification to IEEE standards 802.3ab; cable testing to TIA568A/B). Installers have asked for a tester that validates data cables by testing all the parameters they need to test beyond verifying proper terminations. The Net Chaser is a proven product that does just that." In addition, the Net Chaser measures and displays length for each pair in feet or meters, and improperly terminated cables are clearly displayed on a color graphical wire-mapping display. It verifies continuity for RJ45 and coax cables, generates professional test reports with company details and logo, and has up to eight available testing and ID remotes. The Bottom Line: The Net Chaser includes a comprehensive set of features for testing active network capabilities, including measure Power over Ethernet (PoE) to ensure the correct power is available on the correct pins, use Port Discovery to ensure the correct speed and duplex capability are available; connect at gigabit Ethernet and run ping tests to verify connectivity to IP hosts; discover network devices using Cisco Discovery Protocol (CDP) or Link Layer Discovery Protocol (LLDP); VLAN discovery; Traceroute function displays the path internet packets travel to reach a specified destination. The Net Chaser also saves test reports and exports to PC’sin PDF or CSV format.